[Update 3 @ July 10, 12:43pm] After drawing ire from the Prime Minister Najib Razak, Bung Moktar has finally apologised for his tweet. Read more for details. [Update 2 @ July 10, 12:37am] Unsurprisingly, the sheer virality of the news has gained international attention. Read more below. [Update] The German Ambassador to Malaysia has condemned Bung Moktar’s Hitler reference. More below. In case you missed the big news from the World Cup in Brazil early this morning, the first semi-final match between Germany and Brazil saw the European giants humbling the host nation 7-1, in one of the most shocking football results in recent times. Naturally, Germany supporters were elated at not only reaching the World Cup final, but also in the manner of reaching it. Unfortunately, some fans can and do go a little overboard at times like these. It’s mostly harmless when someone like you and I share victorious status updates, but when you’re an MP and you make a reference to a dark side of world history…that’s another story. 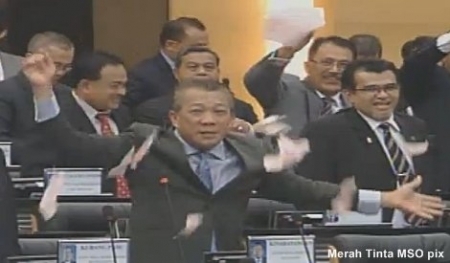 Case in point: controversial Member of Parliament Bung Moktar. The tasteless tweet has already gained plenty of traction. At the time of writing, there are already 170 retweets and plenty more replies, with Malaysians united in condemning the direct reference to German dictator, Adolf Hitler. "@redzwanrashid: “@MyKinabatangan: WELL DONE..BRAVO…LONG LIVE HITLER. ex of one of our Member of Parliament. Y I'm not shocked?"WHATEVER. "@mohdhafidh: Ingat kelakar la tu. RT “@MyKinabatangan: WELL DONE..BRAVO…LONG LIVE HITLER…”"MUNGKIN ANDA ADA MASALAH AKAL. "@An____________: @MyKinabatangan hidu gam ke subuh-subuh ni? "Mungkin kamu mcm P Ramasammy baru minum TODI. Already a controversial political figure known for his…colourful remarks, Bung Mokhtar’s latest shenanigan has again drawn universal criticism. Perhaps the worst part? Judging from his retorts and replies (and use of retweets), he appears to be blissfully unaware of the power he has with his words – not to mention that in Germany, such actions constitutes as a crime. I think people nowadays should transform their mentality. Whatever I tweet people hit me. They are not hitting me because of Hitler, but because I am Bung Mokhtar. While we appreciate the admiration for the German football team, we strongly reject the unacceptable allusion to the fascist regime of Adolf Hitler. [Update @ July 10, 12:37am] The sheer virality of the tweet (and the response that ensued) has caught the attention of the international media. At the time of writing, distinguished international publications such as the BBC, Time and The Washington Post has carried the story. And of course the Daily Mail had one as well. Meanwhile, Bung Mukhtar remains unrepentant, and refused to apologise, stating that even the German Ambassador “does not get it”. "@AnwaruddinM: Kesian @MyKinabatangan. Teruk jugak kena fire. "peduli apa? @norlinshamsul I rasa dia mmg ingat I puji ikhlas. Astaghfirullah, I am speechless. The comments made by Datuk Bung Moktar are unacceptable and wrong, and he will withdraw them. He does not speak for Malaysia, or for ordinary Malaysians, who understand Europe’s tragic past, and respect its modern unity. This should be a time of celebration for Germany, and we wish them all the best in the final.